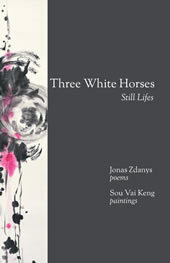 Three White Horses, the forty-eighth book by Jonas Zdanys, is a lyrical-narrative sequence of poems that uses the commitments of lyric poetry to tell a story that unfolds in a closed room in an unnamed city on one snowy night in late November. The poems present pinpoints of experience, internal and external geographies, collectively framed between midnight and dawn, and use elegiac and meditative language to consider deeply human yearnings for meaning and transcendence in a liminal world. The book is enriched by twenty-six new inkbrush paintings by Sou Vai Keng, an artist from Macau, whose abstract paintings are parallel explorations of ideas considered in the poems. Together, poems and paintings create an evocative and powerful artistic whole, a new and original look at the interstices in the search for permanence in an impermanent world. This is Zdanys’ finest work to date. It is a mature and resonant poetic vision. Order from any bookstore, local or online. Jonas Zdanys, a bilingual poet and translator, is the author of forty-seven other books, forty-three of them collections of poetry, written in English or in Lithuanian, and translations of Lithuanian poetry and fiction into English. He is currently Professor of English and Poet-in-Residence at Sacred Heart University, where he teaches courses on modern poetry and directs the program in creative writing. Sou Vai Keng is a literary and visual artist from Macau. Her writings include poetry, novels, short stories and play scripts written in both English and Chinese. As a painter, she specializes in abstract ink painting and likes to explore combinations of poetry and visual arts. Collaborations with other artists have resulted in different poetry publications and mixed-media art works.